A close range brawler, the prime is able to harass smaller mechs and tanks thanks to its twin small and medium pulse lasers. 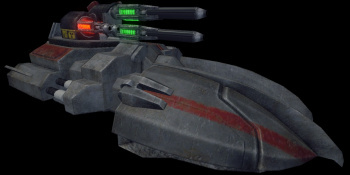 The Hephaestus prime is also one of the few early units with AECM allowing it to cover its allies from enemy NARC's all game and its fast enough to avoid most fire coming its way. Moreover it relays information about nearby shut down mechs or APC data to allies, as well as any enemy Battle Armor in the vicinity. One glaring weakness of Hovercraft in general, and particularly this variant- is its handling. Difficulty focusing damage while remaining mobile across bumpy terrain is particularly felt with this loadout of precision weaponry. Extreme reach with a single cMPL for backup. This unit is all out to out reach any other in spotting and active radar tracking - lacking any electronic counter measures it trades it all for long range punch of the cLRM15. Should the TAG not be exploited by the team to the desired extent, this unit has more than enough to dish out by it's own. And quite for a while with the available two spare tons of reloads. Remember that clan LRM remain viable even in brawling distances! This units fearsome BHP is best used to spot shut down mechs and APCs, and then TAG them to the rest of the team while remaining passive and on a safe distance. While boasting the second highest damage output of the Hephaestus family - the 3 cSPLs and ATM6 (HE) require you to engage uncomfortably close to your enemies. The units one ton extra armor helps in this regard, but piloting this variant still requires constant focus on evasive maneuvering to be combat effective. However, pilots who can survive an extended stay on the battlefield reward their team with radar data from the onboard C3, while sporting a reduced radar signature courtesy of the GECM. While quite capable in close quarters against most Light, and even some Medium Mech's, this unit will find itself quickly overwhelmed if outnumbered or outranged. This variant is best used in tow of a larger mech to draw enemies attention, giving free reign to unleash your incredible firepower on a distracted target. This variant sports the least damage and armor of the Hephaestus variants, instead being dedicated to a support role. One of the more nimble AECM units of the game, paired with onboard BAP and C3 ensure that your team is both informed on enemy position, while theirs is hidden from radar. The cNARC missile allows for marking an enemy target for allied missiles to home into, however it's own offensive capabilities are relatively limited. The single cERLBL does allow you to contribute respectable damage that can be focused, even at range, directly into damaged components, and an additional cERSBL comes in handy in emergencies against opposing Battle Armor. While primarily used to bolster a team built around long range missiles due to its cNARC and Radar suite. While any AECM unit is valuable, the Prime Variant should be considered for supporting a more mixed team. In conjunction with the Hephaestus chassis' in ability to spawn and arm friendly Battle Armor, there is a small niche for using this in supporting a squad of Battle Armor- considering the AECM make the already evasive units radar invisible and untargetable, while the BAP and C3 ensures enemy Battle Armor are visible to all allies, and at an extended range, too. This is no skirmisher, it's weapons bordering on long range by 800m will hardly kill even the BA by a full burst. One has to work the damage in, or pick a nearly dead or severely crippled target. Being short of that, better be moving in a pack, or avoid engagement all together. This unit is best suited for the patient sharpshooter capable to dish and kite. The BAP will give some 200m advantage in detecting nearby units. An unspectacular yet cool starter - able to maintain its performance in most harsh environments and circumstances of most severe battlefield electronic lock down. This scout is a brawler rather than a spotter. Lacking any automatic target relying equipment, short of the voice-coms of the pilot, this variant is closer to the spirit of reckon in force. Once the enemy breaks the distance of the two HML range it will find him self in the land of hurt. The vary pilot is advised to break radar silence as soon as the enemy closes to the range of it's trusty cDSSRM4 launcher to benefit of the self homing salvos while the lasers reload. The disciplined warrior can dish out an nearly constant stream of hurt and sore should he opt to chain fire the lasers. Coupled with the swift and mobile nature of the Heph, one can stay out of the engagement window of most of the assets in game, save for the but few of the lightest and swiftest. The 4 SHS are quite enough for its weapons heat. The BAP will provide 200m head start versus most opponents and GECM will deny additional 200m off from the prying enemy radars netting some 400m of radar advantage - nothing to sneeze at. Selling point? Are you kidding me? Or, are you all out of c-bills and only paying a mere tourist visit to the shop? The "F" there seems to stand for "Far". There is a sweet spot at 1300 meters where all of this variants weapons meet to bear at the extreme of long range. Out of reach of any lock-on missile and any radars not augmented by some Active Probe. The twin cLBX2 and single ATM6 (ER) guided by the 1350 meter reaching TAG will rain hurt while safe on the fringes of the battlefield. The allied guided missiles platforms will bring mutual benefit if the TAG does it's job right. Further, would an enemy try to break the distance, the care taken to position this unit properly will prove if the pilot has mastered the skill or still has lessons to learn. The free ton will spare the owner some time-loss when finally on the right spot. Selling point for this unit is chance - do you have the wast distance to engage from? - as in the close quarters, especially would the foe come more intimate than 150 meter, this units pilot damn better start cursing the enemy - as there is really little injury the insults can be added to. Few heatsinks short of an skirmisher, few hundred meters short of long range fire support, a few weapons short of a brawler, this unit leaves quite some to be desired. Yet still we seem to see many of them on the battlefield - what gives? This one is made to be mid-range firesupport. The two cERMBLs and single ATM6 launcher ideal range is around 600~700m. The GECM and BAP will both augment the radar for 200m while denying detection for further 200m to the enemies. Had this unit a ton to spare, it would equally well be spent for additional coolant flushes, ammo reloads and heat skins, yet it has none, so there is that. If you have company you can count on, this unit will yield you quite some income if you use it wisely and efficiently. Are you, on the other hand, a lone rider, better seek another deal; You have been warned. The first Hephaestus scouting tanks left assembly in 3064. They are being produced exclusively by Clan Hells Horses. Matching its reconnessaince role, it is equipped with a fixed Active Probe and has moderate protection through five tons of armor. Five ton of weaponry allow it to defend itself against lighter opponents. 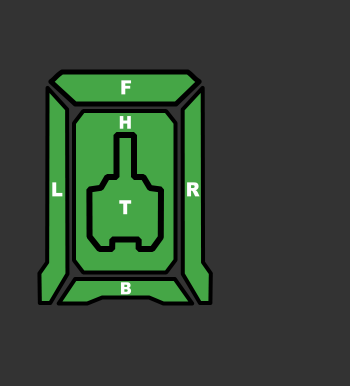 The prime configuration is designed for electronic warfare, carrying TAG and ECM. This page was last edited on 14 March 2019, at 21:29.